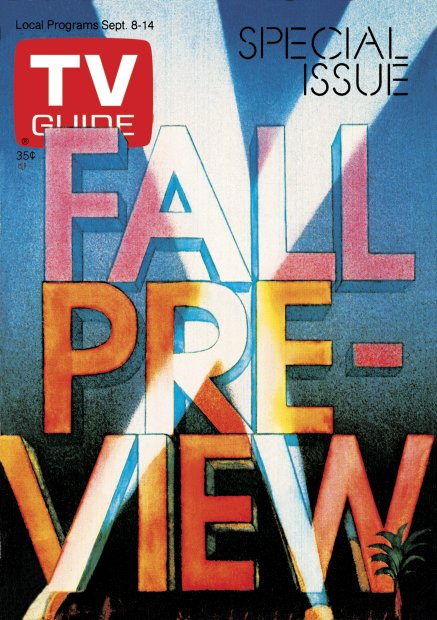 It's always a bit hard for me to decide how to write about TV Guide's famous Fall Preview edition, which is one of the reasons why I don't do them often. * They're so big, so sprawling, it's often hard to know where to start, and how much time one should spend covering them. We'll see how it goes this week; the complaint box will be open as usual. *The other reason being I don't have very many of them. *Not to be confused with Glynn Griffing, former quarterback for the New York Football Giants, or Gwyn Griffin, author of An Operational Necessity. Or Fred Gwynne, for that matter. Now, the sad thing is that I remember most of those shows. Not all of them, mind you, but this was the second year back in civilization for me after having spent six years in the world's worst town, and I suppose I was gorging myself with television, good and bad. 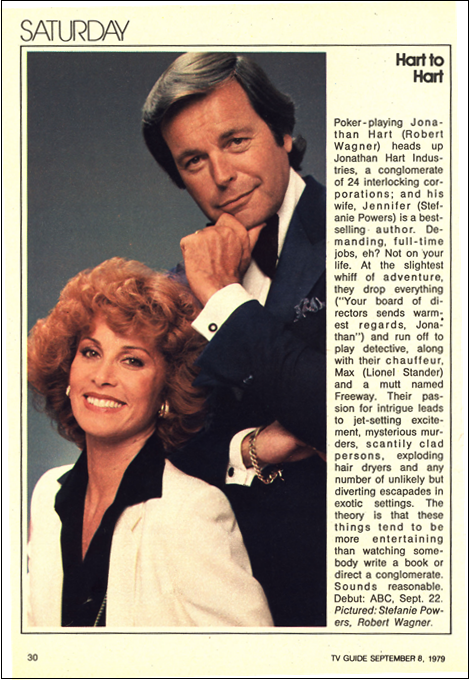 To be fair, there are a few hits in this list; Hart to Hart and Benson spent a good amount of time on ABC's schedule, as did Trapper John on CBS, and Buck Rogers lasted a couple of seasons on NBC. But, if we're being honest with ourselves, there's not a whole lot to like about this schedule, is there? Paris and Lazarus were notable in that they were among the first drama series to feature black actors in the lead roles; neither of them did well. * Sloane gave Robert Conrad a chance to add to his collection of failed series; he probably only trailed McLean Stevenson at that point, with Robert Urich coming on strong. Lobo, which to be fair also ran for two years, was a spin-off from B.J. and the Bear, which means that the character was with us for even longer. Eischeid seems like MLT3K material. And in 240-Robert Mark Harmon smiles. How realistic is that? *The Lazarus Syndrome tried to sell us the idea that a man (Hunter) recovering from heart surgery would, in his effort to give his life meaning, take on a job as a hospital administrator. No stress in that, right? I don't know how this season ranks in television's panoply; I suspect there have been worse, but I doubt that this one went into the Television Hall of Fame. The miniseries is still all the rage, and the networks are lined up to give 'em to you. Unlike the days of Roots and Rich Man, Poor Man, however, the focus is on shorter, more concentrated stories, running for no more than two or three nights. * ABC gives us The French Atlantic Affair (which wasn't quite as bad as you might think, considering it featured Telly Savalas and Chad Everett) and Masada (with Peter Strauss and Peter O'Toole, which was quite good), while CBS gives us six hours' worth of Judith Kranz' Scruples. NBC, which was a pioneer in turning the miniseries into a weekly series, gives us The Gangster Chronicles, The Martian Chronicles, and The Convertible Chronicles. Wait, I got carried away with that one; it's actually The Last Convertible. *The two-night ones used to be called "two-part movies." It's too bad about the miniseries, a genre which in general I quite liked. Look at Rich Man, Poor Man, Roots and Holocaust - all memorable, ground-breaking series. But, as was the case with Who Wants to be a Millionaire, you invariably reach a saturation point where your lust for the dollar causes you to push things a little too far, and for the miniseries that might well have come when ABC did Washington: Behind Closed Doors in 1977. I don't think it's a coincidence that, two years after than series ran, the miniseries was on its way to becoming much, much shorter. Back in 1979, the slack in network miniseries was being picked up by PBS, which still enthralled viewers with mammoth productions on Masterpiece Theater - Poldark (13 parts), Love of Lydia (12 parts) and The Duchess of Duke Street (15 parts) were the headliners. Alas, even PBS has given up the miniseries ghost nowadays, but that's not all it's missing. For some time, Wall Street Journal critic and blogger Terry Teachout has been critical of PBS' negligence of the arts. Even though PBS executives have admitted that they fall short in this area, those same executives have acknowledged, through their programming decisions, that they don't intend to do anything about it. As he recently noted, the network's 2014-15 fall schedule "includes no ballet or modern dance, no classic theater, no real jazz, no opera save for “Porgy [and Bess]” and no classical music of any kind." Such was not always the case, however, for the organization whose original mandate is "to enrich man's spirit." For the 1979-80 season, PBS's Great Performances show includes "a back-to-back production of Jean Cocteau's "The Human Voice" and a film of the Poulenc opera [La voix humaine] based on the play," a film version of Carmen directed by Franco Zeffirelli, Live From Lincoln Center performances by Joan Sutherland and Marilyn Horne, Metropolitan Opera productions from Verdi's Otello to Kurt Weill's Rise and Fall of the City of Mahoganny, and anthology programs based on American short stories, including those of author John Cheever. Finding words to describe what has happened to PBS over the past 35 years that are also appropriate to a family blog escape me, but as culture has dumbed down, we see only too obviously how the nation's preeminent cultural medium has followed suit. But what we've lost in culture, we've more than made up for in football. The NFL rolls out its new season, with what we today would call a "limited schedule." I mean, there are only 20 games scheduled in prime-time - the 16 Monday night games, plus four Sunday night specials that ABC plans to carry. Contrast that with this year's schedule, which includes games on Sunday, Monday and Thursday night virtually every week of the season - 50 games by my count. And to think - the Sunday night ratings in 1979 were poor enough that some people actually thought there was too much football on TV. Suckers. Let's not overlook college basketball in the mix, though. Besides the NCAA tournament (expanding to an incredible 48 teams, not to be confused with the 68 that take part today), NBC offers 90 national and regional broadcasts starting on January 5. Would that the television season waited until then today - I daresay the average basketball fan has probably had access to that many games during the the season's first month. It was about then, as I recall, that the Big Ten Conference (which at the time only had ten teams) voted down a proposal to create a nationally televised Wednesday night Game of the Week. Big Ten teams only played on Thursday and Saturday (barring the rare Sunday afternoon game), the powers that be dictated. And anyway, who would want to see that much basketball? Well, you get the point. I like sports as much as many people, and I like having a choice of which game to watch - but as Captain Kirk once said, "too much of anything, even love, isn't necessarily a good thing." We've often discussed movies, and how the really big theatrical ones have more or less disappeared from over-the-air television. That trend, of course, had not yet appeared in 1979, and TV Guide critic Judith Crist brings us a hint of what we can look forward to: Annie Hall, Jaws, Looking for Mr. Goodbar and Benji on ABC, Coming Home, The Outlaw Josey Wales and Dog Day Afternoon on NBC, and Bound for Glory, House Calls, Silver Streak and Race for Your Life, Charlie Brown headlining the premieres on CBS. Oddly enough, I think that Josey Wales is the only one of these movies I've actually seen, but I feel fairly confident suggesting that with the exception of Benji and Charlie Brown, all of these movies would have been edited, some more heavily than others, for both time and content. They all would have included frequent interruptions for commercials. And that's one reason why, despite my occasional yearning for the bygone days of weekend matinee double-features on local stations, the trend away from theatrical movies on OTA television is a good thing. People (me included) want to see movies run intact, without cuts for one reason or another, and we want them uninterrupted. It's true that you can catch movies on the basic cable stations that offer neither of the above, but others - from TCM to the pay stations - give you everything you want, which is the way you want it. So I'm not always a curmudgeon when it comes to television. The replacement for theatrical movies is the made-for-TV movie, and the much-derided vehicle is still a few years away from the respectability it now holds (save the disease-of-the-week genre, which sadly has outlived the diseases it portrays). One of the sadder notations included in the schedule of coming features is CBS' All Quiet on the Western Front - not because it was a bad movie, per se, but because its presentation on the Hallmark Hall of Fame signals that series' permanent move away from the taped stageplay format which had served it for so well over the years. All Quiet on the Western Front, which starred Richard Thomas, was actually pretty good; would that everything which followed it was as good. NBC has O.J. Simpson in Goldie and the Boxer, and I don't know how I missed that one, nor do I understand why I didn't see Gary Coleman in The Kid from Left Field, Eric Braeden and Melinda Fee in The Aliens are Coming, Lee Meriweather, Loretta Swit and Janet Leigh in the plastic surgery drama Mirror, Mirror or Raquel Welsh in The Legend of Walks Far Woman. ABC touts S.O.S. Titanic, which I did see (and forgot as quickly as possible), with the aforementioned David Janssen as John Jacob Astor, Valentine, with Mary Martin and Jack Albertson in senior citizen love, The New Season starring John Ritter as a track coach mentoring street kids, Cheryl Ladd as a child abuser in A New Start, and Tony Lo Bianco in a biopic of heavyweight champ Rocky Marciano. I make fun of many of these (and even more I didn't list) because their very descriptions sound putrid. Some of them, such as Ladd's child abuser turn, sound like obvious Emmy bait. There might have been some good ones in there, but when you can't get past the title, it's kind of hard to find out, insn't it? Maybe some of you have seen them, and you'll be able to set me straight. Finally, some notes from, you know, actual programming. Saturday night is the Miss America pageant, live from Atlantic City on NBC. As is customary back then, the broadcast starts at 9pm CT, running for two hours. The redoubtable Bert Parks is the host, former Miss Americas Mary Ann Mobley, Dorothy Benham and Susan Perkins are the television hosts, and the winner is Cheryl Prewitt of Mississippi. According to the always-reliable Wikipedia, her husband's brother-in-law is televangelist Richard Roberts, who's father is the famed Oral Roberts. You can't make this stuff up. The Emmys air on Sunday night, hosted by Cheryl Ladd and Henry Winkley (and even without looking at the page I could tell you it had to be on ABC) and the big winners were Taxi, Lou Grant, Roots: The Next Generation, Carroll O'Conner, Ruth Gordon, Ron Leibman and Mariette Hartley. Monday night features part one of the rerun of NBC's Holocaust, up against the season kickoff of Monday Night Football with the Atlanta Falcons and Philadelphia Eagles. On Tuesday, it's the season premieres of ABC's sitcom superstars: Happy Days (with a cameo appearance by Laverne and Shirley), Angie, Three's Company and Taxi. Wednesday features an absolutely dreadful crossover movie on ABC - Charlie's Angels on The Love Boat (there's never an iceberg around when you need one). Thursday's edition of ABC's 20/20 asks the burning question: what really killed Elvis. At least they didn't ask who. 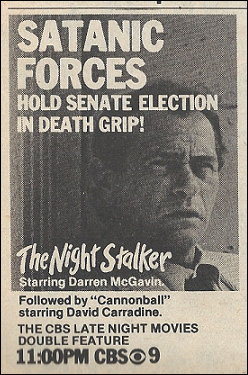 And on Friday CBS' Late Night Movie (which, thanks to Channel 4's insistence on running local movies, appears on the independent Channel 9, and is joined in progress after 30 minutes) has Darren McGavin's wonderful The Night Stalker, the ad for which has perhaps the best headline I've seen in quite some time: "Satanic Forces Hold Senate Election in Death Grip!" Talk about being ahead of your time. So that's the kickoff of the 1979-80 television season. Loyal readers know in general my low opinion of this era of TV, which I think is best summed up in a pair of Letters to the Editor. Elaine J. Johnson of Wickenburg, Arizona says the thought of Laverne & Shirley, Mork & Mindy, The Love Boat and shows like them taking the high ratings makes her wonder "if we will be deluged with more of this type of show next season," and asks the networks to "serve up fewer giggle shows and more informative, family-type entertainment." Meanwhile, Judith S. Felton of Marietta, Georgia reminds us of Newton Minow's "vast wasteland" quote and wishes the networks "would realize that there are some adults out here who don't use TV as a baby sitter and who would like a little something to entertain us." Ladies, from 35 years in the future, I feel your pain. - Gwynne Gilford was the daughter of Anne Gwynne, a Universal contract actress in the '40s (westerns and horror movies, mainly). Gwynne the daughter married Robert Pine, who at this time was the sardonic sergeant on CHiPS. Their son is Chris Pine, who's Captain Kirk in the rebooted Star Trek movies. Circle Of Life, TV style. Paris was where James Earl Jones met his future wife, actress Cecilia Hart; they remain married to the present day. I'll get to some these others in the due course. Mike, I love those links! How do you know all this? Seriously - it's those tidbits that I love looking for and finding. They really enrich the content, and I appreciate the additional context they give. I'll ask again - want to guest host for a couple of weekends sometime? IMDb is a major help - most of the time. Over the years (64 of them as of the 30th of this month), what started out as curiosity gradually evolved (some might say mutated) into a mildly insatiable desire to answer any question I could come up with. As a kid, it was seeing old movies in the afternoon, then seeing new TV in the evening - and finding many common names in the credits of each. These days that's getting harder and harder to do - you know why - and I'm freezing the frames on my DVDs and DVRs more than ever, doing those link-ups for my own sake mote than for any other reason. I've mentioned in the past that the "TV critics" I grew up reading were less than no help in understanding how the TV business operated. As it is, I can still be surprised by events from the '50s and '60s that, if the press of that time had covered them in more than a cursory fashion, might have made even bigger stirs than they did then. Instead, we were stuck with "experts" who held their beat in total contempt - not to mention their readers. Even now, it still seems that most papers give the TV column to the last guy in the newsroom who says "Not It!" Whine whine whine - even I get tired of it. I have no blog of my own, and have no idea how one goes about doing that. Just commenting on other people's blogs is enough of a struggle at this stage (see my age, op cit.). I mjght be back tomorrow with more stuff - if I feel like it. When you mention PBS having mini-series I . All of the ones you mentioned were British. Either ITV or BBC one off serials. Because Public TV and radio is not funded fully Public TV can't afford to make them then or now. And the reason that public tv, not PBS, doesn't have long serials is because British TV doesn't have them anymore. British TV has such short series that calling the one off serials mini-series is to misunderstand british programming. No, I'd agree with that. I've always appreciated the British concept of "limited series," not only because it keeps the season from dragging, but because fewer overall episodes keep the show from going stale. As much as I'd like to see more episodes of "Blackadder," for example, I think they were absolutely right in keeping them limited. Although TV Guide didn't list these as miniseries per se, I still think that "I, Claudius," for example, compares more favorably to "Roots" than, say, "Sherlock" does. "Sherlock is clearly an episodic drama, whereas the classic Masterpiece Theater programs used storytelling formats that were more like NBC's "Best Sellers" series ("Captains and the Kings" being perhaps the best of that series.) But the reason "Upstairs, Downstairs" doesn't count as a miniseries, to my way of thinking, is that it returns year after year. My own thought is that shorter attention spans and the desire for more instant gratification are two reasons why we don't have more extended series than we used to. But regardless of what they want to call it, I'm still saying that something like "The First Churchills" absolutely fits the American definition of a miniseries, especially used in the way that PBS did. I could be wrong on this - correct me if I am - but I think the only extended series that PBS ever produced without importing it from England was "The Adams Chronicles." That's why I like the term on off serial. Yes Upstairs Downstairs was an ITV series, like Downton Abbey. You know that WGBH is the importer of the Masterpiece and Mystery series. PBS is a distribution network, not a true network like the commercial nets. Addams Chronicles was created by WNET and distributed by PBS. And funding most likly came from CPB, corporate and foundation underwriting. Working at a small public radio station makes me more aware of how. Public broadcasting works. Good reason why ABC was the only network carrying college football in 1979: Beginning in 1951, and continuing through 1983, the NCAA limited the number of live college football games on television. Basically, when there was a network college football game, no other college football game could be broadcast. And with very few Friday-night or Saturday-night games back then, there were very few live college football games outside of the network package. Some TV stations taped local college football games for taped showings that evening. I believe the NCAA rules by 1979 barred taped-delay telecasts from starting any sooner than 10:30 P.M. Eastern time. At one time, games were mainly national telecasts, but by 1979, there were several weeks where there were regional telecasts. The NCAA's policy was shot down by the Supreme Court in 1984, which opened the way for unlimited television coverage of the sport. Today, every Football Bowl Subdivision (Division 1-A) game is televised, whether on a local broadcast station, a regional cable sports network, a national broadcast network, or a national cable sports network. Is the book you mentioned by an author named Keith Dunnavant. If so I have a copy of the book also. Quite correct. "Tis a tangled web of relationships, isn't it? So Channel 9 joined the Late Movie in progress every Friday night? That's one click away from putting up a slide that says "turn the TV off and go to bed." Yes. Joining a 70- minute program (60 + 10 minutes of extra commercials) 30 minutes into it? Call me crazy, but I have a feeling that viewers might have a hard time catching up with the story. * Actually, the first name that came to my mind was Jack Gilford. But then again I've probably seen too many sit-coms and Cracker Jack commercials in my lifetime…. And….. you've NEVER seen "Jaws"????????????? ?